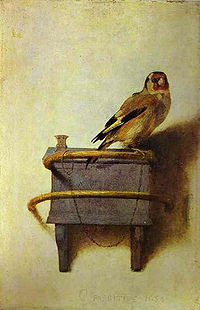 Carel Fabritius, The Goldfinch, 1654, oil. Simple and striking. This painting is the epitome of simplicity and I’m not even disappointed. I’m a huge fan of birds, weird I know, so I’m a bit partial to this image to begin with. The fact that I’m also a firm believer of "less is more," only adds to the appeal of this image. The warm intimacy that the painting oozes pulls your eye in and you can’t help but wonder the story this little finch has to tell. His glossy, small eyes could be saying anything. I wonder how he got to the perch and where’s he’s been. Did he just get back from a travel with his love and got separated? Or is he young and this spot is where he’s beginning his journey. It’s hard to tell. Just like the guy you see everyday at the coffee shop and can’t help but wonder where he’s from, what heartbreak he’s had and where he’s going. That man is this bird, and we’ll never know. Outside of its intriguing expressive quality, the composition of this piece broke boundaries. A student of Rembrandt, Fabritius used the lighter color in the background and the darker, richer color on top. This was unheard of in the artistic world of this age. The dark color was always used in the background and the lighter, brighter color was to go on top. Although a shove to the man at the time, this painting is truly a masterpiece. The combination of cool colors in the image creates a tender sentiment that you can’t help but immerse yourself in. Everyone has a story so therefore everyone is, in some way, a little Goldfinch.